Demonstrates how to use MVVM to databind multiple SciChart charts in a hierarchy of ViewModels. This example creates multiple line charts, with View and ViewModel per chart and one master group ViewModel to contain them all. 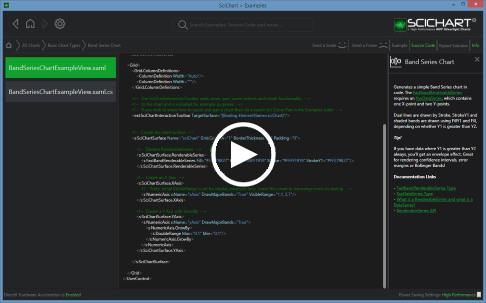 It shows how to bind SciChart to a data-source and append new data using the MVVM pattern. Note: Also see the documentation and examples featuring the SeriesBinding Markup Extension, as this shows how to declare RenderableSeries and DataSeries from your ViewModel, for a true MVVM application. The C#/WPF source code for the WPF Chart Bind Multiple Charts MVVM example is included below (Scroll down! ).